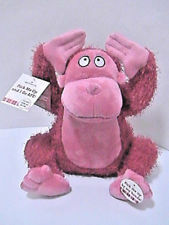 Press the button on the foot of this adorable Plush red and pink ape & it sings a fun version of "Shout". The ape sways to the music. He's INTERACTIVE...when you lift the ape by his hands it gets upset and makes monkey sounds until you put it back down. Notes: Please note that this item was never packaged or sold in a decorative box.